Launched in 1965 as part of President Lyndon Johnson’s Great Society campaign, Head Start & Early Head Start is dedicated to research-based child development, continuous innovation, and proven results. Led by Christine McWayne and Jayanthi Mistry at Tufts University and colleagues, Daryl Greenfield from the University of Miami, Betty Zan at the University of Northern Iowa, and Kimberly Brenneman at the Heising-Simons Foundation (and formerly, the National Institute of Early Education Research – NIEER), the RISE project focuses on developing ecologically valid, culturally relevant integrative preschool curriculum components and home-school collaboration to support young dual language learners’ (DLL) school success. (1) Science, technology and engineering (STE) early learning; and (2) Home-school collaboration (HSC) forged through authentic exploration of families’ funds of knowledge, daily activities, and home routines with their children related to STE. Through the RISE project, we are co-constructing an integrative STE curriculum with Head Start teachers and families, informed by national and state science and engineering standards, while focusing on authentic relationship-building, capacity-building, and continuity as key aspects of the curriculum development and implementation process. Learn more. 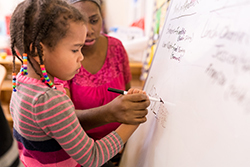 The Communities for Healthy Living (CHL) program, through Harvard University T. Chan School of Public Health, is a family-focused program intent on promoting healthy behaviors among Head Start families. Developing healthy lifestyle behaviors early in life reduces children’s risk of becoming overweight and protects them from lifelong chronic diseases, such as type II diabetes and heart disease. A Community Advisory Board was formed in 2015 to involve parents in providing feedback on the health messages, topics, and activities that will be included in the curriculum that is being developed. The CAB is comprised of staff, community members, and Head Start & Early Head Start parents and allows our families to engage on a meaningful level and develop and exercise their leadership skills. The CHL program will include an 8 week peer-led parent program (known as “PC Connect”), enhanced family nutrition counseling, and a social media campaign. The skills learned will support the establishment of healthy diet, physical activity, and sleep behaviors, which bring many health benefits for families. Learn more. 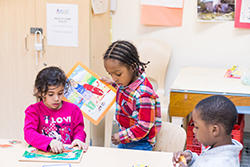 ABCD Head Start has been awarded funding for an initiative in which we work closely with the Department of Early Education and Care, Boston Public Schools, and several child care providers in Boston to provide full day, full year pre-Kindergarten programming and increased salaries for staff. Similarly, we have two classrooms in South Boston that receive additional support through the Jessie B. Cox Charitable Trust Fund to provide the same curricula (described below) and staff salary increases. 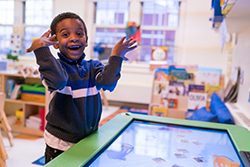 As part of our collaboration with the Boston Public Schools (BPS) and the awarding of programs to participate in the PEG, six of our Head Start classrooms began using the “Open to the World of Learning” (OWL) literacy curriculum and the “Building Blocks” math curriculum model. These models are used by our LEA in their public pre-kindergarten (K1) classrooms. Parenting Journey I is a parenting curriculum that helps participants become more confident in their parenting styles by building on their strengths, resulting in a more nurturing family relationship. It is 12 week introductory curriculum focusing on promoting attitudes that enhance good parenting behaviors and providing the tools for parents and caregivers to effectively model these behaviors at home. Parenting Journey is offered at every ABCD Head Start & Children’s Services program. We offer Parenting Journey in English, Spanish, Portuguese, Cantonese, Mandarin and Haitian Creole. Learn more. BFEN is a citywide coalition focused on raising awareness about the importance of family engagement in the life of a young child. Activities include promoting parent education, family engagement and early literacy; providing transition supports to families; increasing families’ awareness of child development and age/developmentally appropriate activities that promote school readiness. ABCD has two Boston Family Engagement Network sites; one in Mattapan, and another in Roslindale and Hyde Park. ABCD staff also sit on the Governing Council for BFEN. Learn more. The Home for Little Wanderers (HFLW) received the William C. Boyan Award from the Office of Community Health at Boston Children’s Hospital and has partnered with ABCD Head Start to implement a new project based on recent research by Walter Gilliam at Yale University regarding factors leading to suspensions and expulsions of preschool children. This research found that one of the most highly correlated with suspensions and expulsions were teacher stress levels. A project has been initiated that aims to create a more favorable social and emotional classroom climate, helping the teachers form more effective relationships with the children, particularly those who present more challenging behaviors, and increasing children’s capacity for self-regulation. Additionally, the project aims to better support teachers, in the hopes that they experience less frustration, feel more competent and empowered, achieve higher job satisfaction and develop means for better self-care, all of which would reduce the variable of teacher stress and hopefully, staff turnover. Launched by United Way with the support of its Private Equity/Venture Capital Leadership Council in 2014, DRIVE is a groundbreaking initiative for achieving universal child development screening for young children. The data collected through DRIVE will allow families, teachers, health providers, and community leaders to take a data-driven approach to early childhood, making informed, strategic decisions to tailor support and resources to the children, families, and communities that need them most.ABCD is partnering with drive to enhance its use of the Ages and Stages Questionnaire (ASQ).By joining other Boston agencies as DRIVE partners, ABCD will have access to ASQ and ASQ:SE online and reporting tools and will participate in learning collaborative meetings. Learn more.